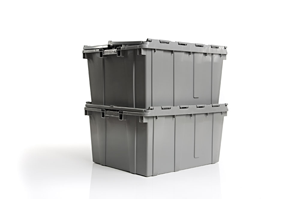 AR- (attached lid and recessed), 2.4 cubic feet capacity with 50lbs weight capacity. Offers a stack and nesting design. Ergonomically designed to be lifted without injury. Caution must be exercised. Size 24x20x12 Light Grey- Solid and Durable. Priced - Single units $50.00. Shipping and Taxes Extra.